Posted by Duncan in PeopleTools 8.54. The next version of PeopleTools is expected to be released in a couple months’ time. 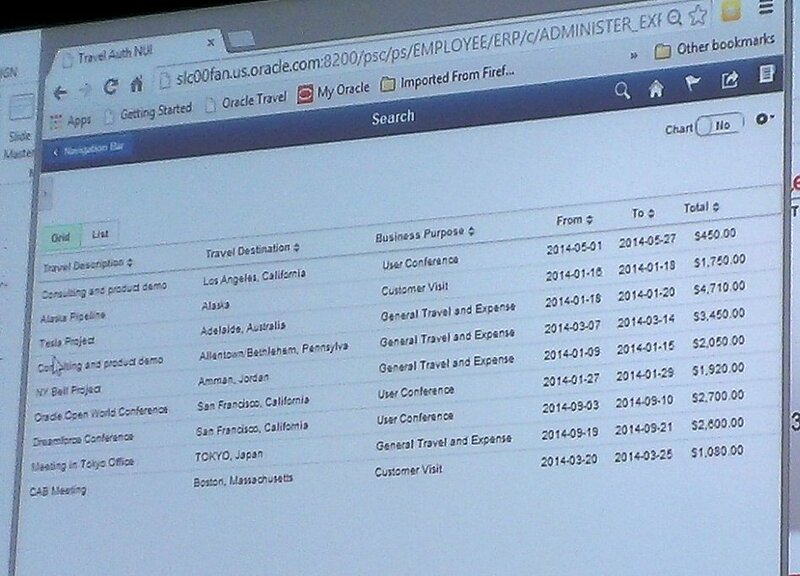 Oracle have now made available both the Release Value Proposition and the Pre-Release Notes for PeopleTools 8.54. As no more official documents are expected before the release hits GA (General Availability) now is a good time to pick through the details and highlight the areas that are of most interest. There is a lot of content to cover so – to prevent this entry becoming too big to read in one sitting – I’ll spread it over several parts. This first part will look at the back-end, infrastructure and System Admin changes, whereas subsequent posts will move up the software stack with integration and reporting, and finishing with the new UI. Each new release of PeopleTools adds new supported platforms and retires older versions. PeopleTools 8.54 introduces support for new versions of Oracle Weblogic (12.1.2) and Oracle Tuxedo (12.1.1), and deprecates WebLogic 10.x and Tuxedo 11.x. The version 12 releases are the only supported versions of these technologies. Also added are some new server OS versions: Windows 2012 and 2012 R2, plus Oracle Linux v6. Deprecated OSes are Windows 2008 R1 (although 2008 R2 should still be supported) and zOS 1.11. On the database side Oracle 12c is added and 10.2.0.5 and 11.2.0.3 removed (so 11.2.0.4 should still be supported). SQL Server sees MSSQL 2014 added and MSSQL 2008 removed, leaving 2012 and 2014 as the supported versions. Without doubt the most difficult items to adhere to will be the client browser and OS certifications. Firefox and Chrome are straightforward as they typically auto-update to the latest versions, however for enterprises where the mandated corporate standard is Internet Explorer it gets a little trickier. Support for IE11 has been added and IE8 deprecated with PeopleTools 8.54, leaving IE9, 10 and 11 as the supported versions. If you wish to use the new Fluid UI however, you need to get your users to IE11. 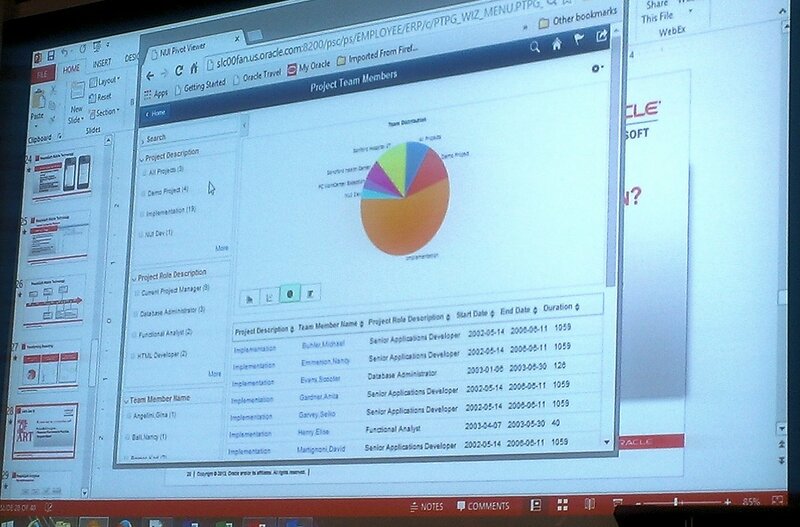 Users on IE9 and 10 will get the ‘classic’ UI, which means the look and feel from PeopleTools 8.53. Finally, you’ll also need to ensure that your clients are on Windows 7 (64-bit) or Windows 8.x. The 32-bit version of Windows 7 is not supported. As with all PeopleTools versions, it is possible to run using an un-certified browser and client OS combination, however there may be some workarounds required for edge-case functionality. This release brings some enhancements specifically for the Oracle RDBMS. PeopleTools already has temporary tables built-in to the toolset (i.e. if you wish to enable multiple copies of an App Engine to run concurrently you need to build that many instances of the Temporary Tables). With Tools 8.54 you can take advantage of Oracle Global Temporary Tables within the database itself (but only for batch processes, not online page operations). GTTs are working tables that are process specific, so each concurrent process doesn’t have access to the working data from the tables from another version of the same process, and they’re lighter-weight on the database (specifically, they don’t generate redo) so they are more efficient to use. Some clients have already made use of this, including one major retailer here in the UK – with the assistance of a DB tuning guru – however now it’ll be built into the PeopleTools toolset rather than requiring customisation. For the uninitiated, a materialised view is a special database object where the results of the view SQL is stored as a data table. They’re especially useful for migrations, integration, reporting and data warehouses as they save repeated queries against the same data. Complex SQL can be used in a Materialised View so that it is performed once, and then any subsequent queries for the same data can use the data stored as the view output rather than running the query again. Oracle’s 12c database comes with the ability to store ‘pluggable databases’ within a ‘container database’. This reduces overheads by saving on disk space, CPU and memory, but also by enabling database patching to be performed once. PeopleTools 8.54 includes support for the pluggable databases within the Oracle 12c database platform. Many clients use partitioning on their tables, particularly with PeopleSoft Global Payroll and large numbers of employees. It was possible to partially configure this from Tools 8.51, however partitioning can now be completed entirely within App Designer with Tools 8.54. What functionality has changed for developers in Tools 8.54? For a start, the developer tools are now 64-bit, which – aside from the performance benefit – will make developer client machine administration easier. This includes not only App Designer, but Data Mover, Change Assistant, App Engine etc. The other major improvement – and it’ll be a much welcomed one – is code completion in App Designer. Many other IDEs have had this functionality for a while so I’m grateful that we’re going to be seeing this in PeopleTools. App Designer will auto-complete after the developer uses a ‘.’ for constants, system variables, functions and app classes – not just showing the method but the parameter details also. An intriguing item in both of the Oracle documents is the ‘Automated Configuration Manager’. Neither document gives a great amount of detail, but it sounds like an improvement or twist to the Automated Environment Configuration tool that Hakan Biroglu blogged about. As a sys-admin this is particularly exciting as it’s moving PeopleSoft towards the ‘dev-ops’ holy grail of automated configuration management popularised by tools such as Chef and Puppet. Any tool that makes the creation of new environments quicker, or reduces the changes of configuration getting out of sync will be very welcome. The next version of PeopleTools is bringing many improvements. Much is being made of the new User Interface – and rightly so – however there are other improvements that we will improve our workflow by making it both simpler and more efficient. We’re quite used to hearing Marc Weintraub and Jeff Robbins speak here in the UK. They come over every year for the roadshow, and they’re the sessions that everyone attends for. Marc’s style was a touch different this time in that he gave us a little more insight into his personality. Finding out who his sports teams are, what he does for fun (running Tough Mudders), what he drives (surprisingly, a Mini Cooper) etc rounded him out more as a person in our eyes – an important change as previously we really only got the professional side of Marc. Jeff’s style was the same as ever … dry, humorous, and very comfortable and relaxed speaking to a room full of people. At one point he even paused his session so that he could photobomb a pic I was taking of his demo. So what did we learn about PeopleSoft from a strategic point of view? The switch to patching via images every 10 weeks means that customers don’t have to wait for a major release to gain new functionality. This does sound more like the continuous delivery model that has been used with Campus Solutions (where there is no major release) whereby new functionality comes via regular bundles. As a result, the 9.3 applications might just be a roll-up of everything that has been released in the images since v9.2. There are some interesting implications of this, and we’re not sure how a client can truly be sure that they are on 9.3 if they’ve only applied some of each of the patches that comprise it. The 9.3 releases are still looking like appearing in 2017, but it doesn’t have focus within Oracle as continuous delivery is the preferred method of providing new functionality. There is an internal edict not to target functionality for 9.3 as that means you’re not thinking about delivering something now, which does sound a positive message. Much was made of the fact that PeopleSoft is “the only enterprise application suite that gives you the ability to deploy PERFECT FIT applications, through the use of PeopleTools.” After years of customisation=bad it’s interesting that there is now an admission that often a small amount of judiciously applied changes are needed to fully meet client expectations. EDITED above paragraph on 11th April to correct paraphrased quote. There was a lot that was exciting to see here. The new UI (christened FLuiD) is very contemporary and pleasing to look at. It works across multiple devices (i.e. mobile, tablet and desktop) and is responsive based on the device resolution. Jeff gave a live demo where the items on the screen realigned themselves and changed as he dragged the width of the screen to be smaller. Role-based landing pages (eg. for execs, team members, employees). It appears to have been very well thought through. The previous changes to the UI have been ‘all or nothing’. If you wanted the Swan UI (Tools 8.50) or the Tangerine UI (Tools 8.53) it was switched on or off as a system side setting. Whether or not the FLuiD UI is shown is based on your preferences and whether your device is capable of displaying it, so one user may get the full FLuiD UI and for another user with an older device PeopleSoft will seamlessly fall back to the ‘Classic UI’ – which I assume means the Tools 8.53 tangerine UI. Unified UX seems to be a trend at the moment as Fusion R8 has introduced a new UI also. This UI convergence is sensible from a co-existence P.O.V. as users are going to be surprised if you switch them to Taleo and the look-and-feel is different. 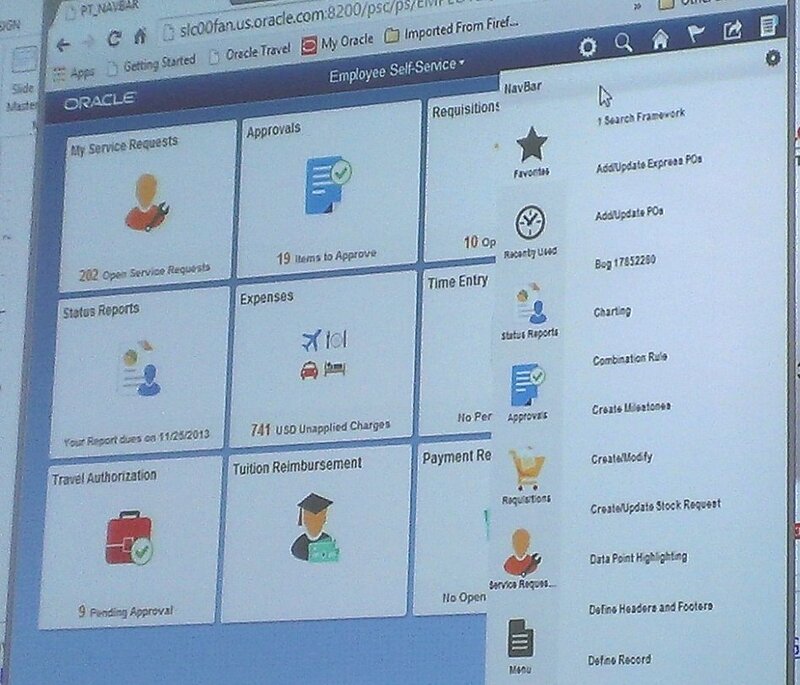 It’s notable that as Oracle’s applications UIs converge, PeopleSoft is often getting there first – possibly because of the toolset, and possibly as it had a better UI starting point. 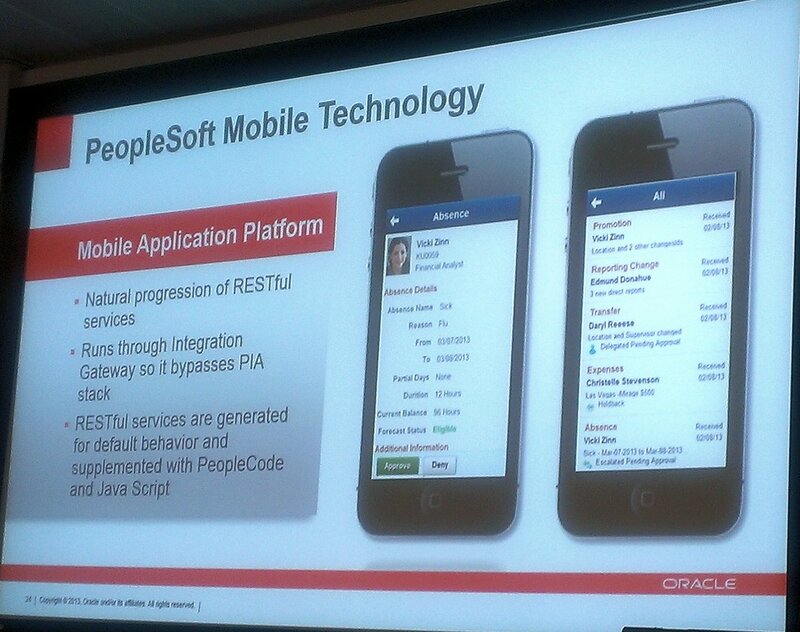 Often Fusion or EBS or JDE adopt UI elements that PeopleSoft has already adopted. The FLuiD UI components are new components that run alongside the existing components. Security is inherited however, if you have security for the existing ‘PIA’ component then you’ll be allowed to use the new component. In terms of browser requirements, we’ll need IE9 for the Classic UI and IE11 for the FLuiD UI. You can still use FLuiD on your smartphone and tablet without issues, and you can use Chrome, Firefox or Safari quite happily. Aside from the UI, what else is new in Tools 8.54? Also arriving is the Mobile Application Platform (MAP). This is a standalone app – i.e. it’ll be native to your device, and can retain credentials etc. Applications for MAP will come in a PUM image after Tools 8.54, but there was no comment about how quickly after Tools 8.54 this will come, and maybe not until Tools 8.55 (Oracle aim to release a new version of PeopleTools every 15 months approx). 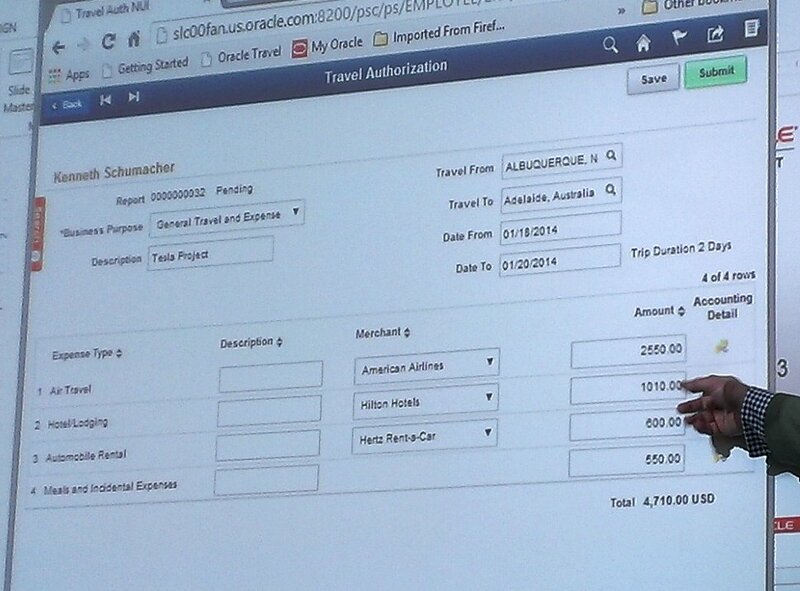 There are also lots of changes for analytics and reporting. Pivot Grids are getting a lot of new functionality – and they’re already better and more dynamic than much of the competition offers. It was stressed that Pivot grids aren’t static images pasted onto pages, or from data taken into other systems, but live and dynamic analytics over your data. You’ll also be able to add multiple pivot grid views on top of a pivot grid model from 8.54. Jeff also demoed functionality where a component search page was replaced by a pivot grid, allowing you to select segments of the grid to refine the search results. This was a very slick upgrade to the search facets that we’ve previously seen. PeopleSoft Test Framework in 8.54 has improved around management of test cases and delivery of pre-supplied test cases will apparently come in later tools versions. As well as the Oracle guys, Graham Smith from Oxfam also gave a session on their Financials upgrade from 8.9/8.50 to 9.2/8.53. 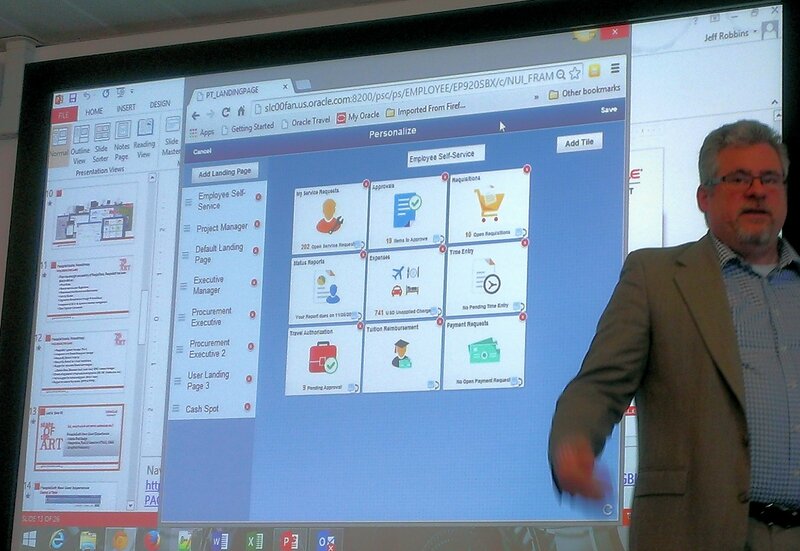 Graham was particularly enthusiastic about the new PeopleSoft Images and the PUM update process. Although he did concede that the PUM process is difficult to get the hang of initially – and that they ended up doing some things more than once – however it works very well for them now. Upskilling the team in advance was very important. The Oxfam approach is to divide up the improvements, allocate them to team members and give everyone time to research their topics and then report back to the team – which seems a very good way of improving the team quickly. It has added a new requirement however, as it doesn’t replace the DMO environment (we need DMO to contain the vanilla versions of just the patches that we’ve applied), whereas the PUM image contains all modules and patches that have been released. We previously used Oracle Support as the repository of all patches and bundles. Oxfam have also used Performance Monitor to gather intelligence on how their users are using the system. It’s really interesting to gather stats on which areas of the system are used the most (both ‘Most popular components by number hits’ and ‘most popular components by the number of users’). This allows the team to invest time in the components that are used the most, or are used by the most users – thereby targetting the effort at the areas which will give the most impact. – The Merge page functionality in App Designer is really useful during upgrades when comparing updated pages with customised ones. – Reapply customisations in module order (as this helps the testers) instead of object type order. – When applying custom code, aim for empty events if you can, as the cost of upgrading is less (as there’ll be no code to compare). Graham also spoke about SES which they’ve found to be very fast and doesn’t need particularly beefy hardware. They have needed to spend some time looking at indexing, but in the main it’s a positive experience. In conclusion, this was a very strong event with lots of great content. The next versions of PeopleSoft are going to bring a lot of exciting changes, and we can’t wait to read the Release Value Proposition when it is released. Next up in the ‘How I work‘ series is Jim Marion. I suspect that for most reading this Jim will need no introduction, however as I’ve given everyone else a mini-biog I shall do the same for Jim. 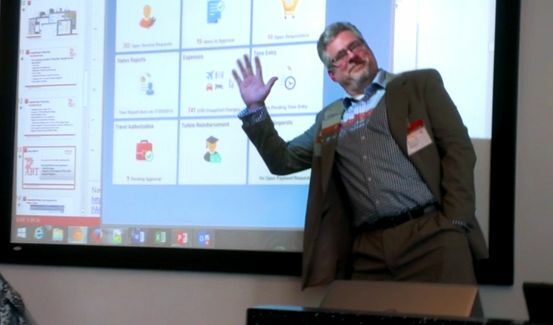 Jim is Oracle’s most publicly-facing techie, and I suspect one of it’s most senior technical brains. 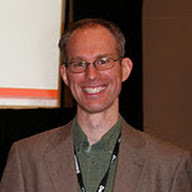 Jim’s blog – Jim’s PeopleSoft Journal – is one of the (if not ‘the’) most useful and forward thinking PeopleSoft blog(s), and probably the one that gets the most traffic. Jim is a frequent speaker on the US conference circuit where his ‘PeopleTools Tips & Techniques’ sessions are the first ones in many peoples’ agenda planners. Jim is also a published author, with both PeopleTools Tips & Techniques and PeopleTools Data Management and Upgrade Handbook to his name. To top it off, Jim is also a wonderful mix of unfailingly helpful and pretty much always correct. My phone and some sort of internet connection are both very important. 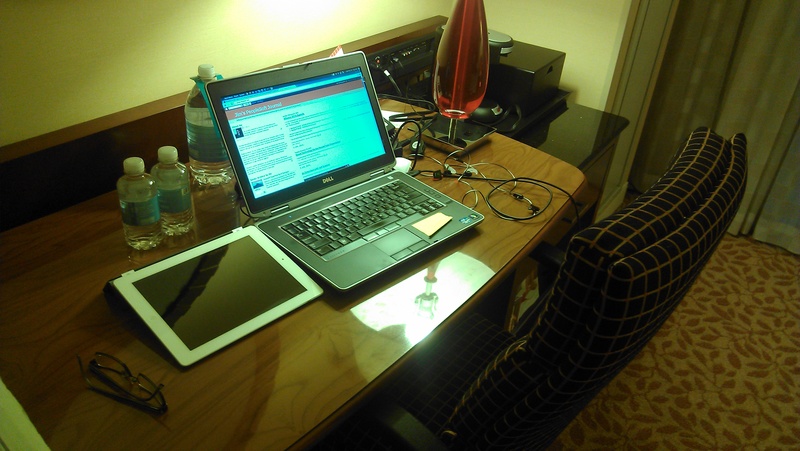 As a remote worker, if I have internet and a dial tone, I can work from just about anywhere. When traveling, I really enjoy having a few books in my Safari Books Online iPad book bag. As far as productivity apps, here is a list of what I use daily: vim, gedit, VirtualBox, KRDC (remote desktop), jEdit, SQLDeveloper, AppDesigner, JDeveloper, Eclipse, Fiddler, Wireshark, Pidgin, Thunderbird, Skype, Vonage, and most of all: Google search. My phone and laptop are the two most important. My iPad really helps me keep up with book reading. My Verizon 4g hotspot keeps me connected when hotel or airport WIFI are not very good. For development, I use Application Designer, SQLDeveloper, jEdit, and JSLint. I also spend a lot of time in discovery and analysis. For this portion of my work, I use Fiddler, Firebug, and SoapUI. If you use the PeopleSoft database cache option instead of file system cache, you may already know that you can strategically clear segments of the cache. Unfortunately, with database cache, performing a full database cache purge with psadmin can take a very, very long time. Here is the tip: truncate psobjcache before clearing cache with psadmin. I write a lot of SQL against the portal registry and security tables. Code assistance in AppDesigner’s PeopleCode editor: auto fill, auto complete, auto… I spend a lot of time in the PeopleCode Language and API reference verifying syntax. It would be really, really beneficial if App Designer just displayed that information like other integrated suites. Problem identity and resolution. I have an eye for things that are out of place. “A generous man will prosper. He who refreshes others will himself be refreshed.” Proverbs 11:25. Posted by Duncan in Look and Feel. I received a sobering lesson today in the value of good ideas, versus the execution of these ideas. 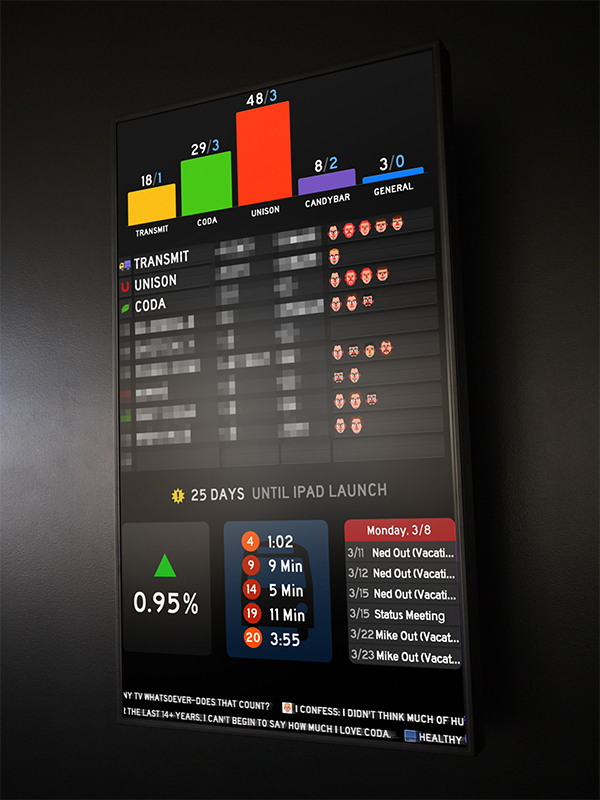 This was around the time that PeopleTools 8.50 came out, and I believed that a similar looking status board could be easily created using some query pagelets, some styling and a custom portal. Failing that, I could just knock the whole thing up in iScripts. It’d take probably about a week’s work to build. This status board could then be displayed on a big screen mounted on the wall in whichever department had commissioned it (be it HR, Payroll, Recruitment etc). Not homepage dashboards, but a department-wide dashboard that continually updated. I pitched my idea around at work but lacked the tenacity to drive it through. In short, I didn’t execute and the idea withered. Fast forward 4 years to today and I’ve just read an interview on the Zapier blog with the founder of Geckoboard. He read exactly the same blog post as me and had a similar idea, however he executed on it and built a thriving company on the back of his efforts. The value of the idea was trivial, compared to having the conviction to execute on it. A sobering lesson indeed. Next up in the ‘How I work‘ series is Anton de Weger, my first boss in the PeopleSoft world. Anton ran Congruent UK, the consultancy I worked at for 7 great years and I owe much of what I’ve learnt to him. Congruent was – for it’s no longer in existence – full of great consultants, not only in their technical or functional ability, but in a desire to behave ethically for the client – something that came from Anton at the top. Not only is Anton a great leader, but he’s brilliant technically too. He possesses a ‘Steve Jobs like’ reality distortion field, where all technical tasks somehow seem easier when he’s around. He’s still the only person I’ve ever seen – when there was a network outage – fire up a blank notepad session and write an SQR from scratch. Anton has since returned to Australia where he’s currently working on a 9.2 upgrade. Current computer: Metabox (Win7, 16GB RAM, SSD, Radeon 6900M) third in a line of luggable powerhouses that can warm my lunch as well as run a PeopleSoft VM or two. I work: I have a bit of a love/hate relationship with PeopleSoft these days. I’ve been trying to get away from the application for a while, but it still keeps pulling me back in. I dislike the lack of development and focus on PeopleSoft from Oracle, and I feel this is limiting the potential for new blood and enthusiasm in the market. Also, is it just me or are PeopleSoft implementations getting harder? My personal view is that the off-shoring and out-sourcing of the project teams are counteracting the benefits and efficiency of projects. However, in the end I love PeopleTools as a corporate computing platform and I think its flexibility and structure are underappreciated. I’m driven by solving problems and feeling like I’m making a difference to my customers and if I can link that up with an occasional good technical challenge and a good team then I’m happy. 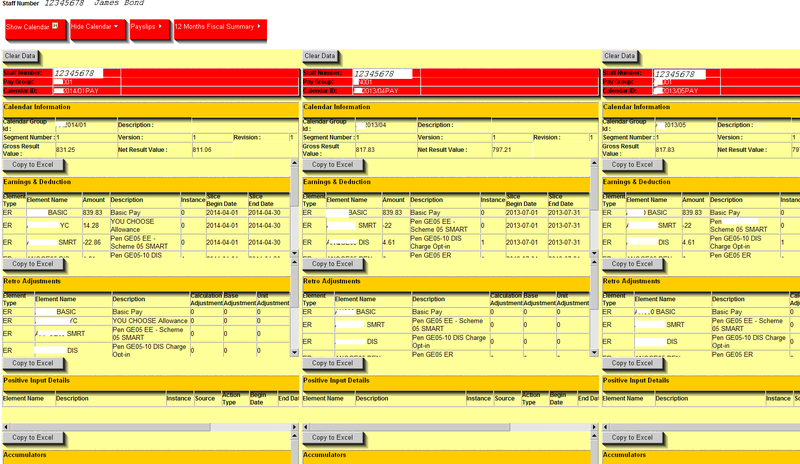 Snag-It: There is always a need for screen shots, whether you are doing Technical, Functional or Project Management work. Podcasts: For the commute into work, either educational or humorous. Notepad++: moving to this as a general text editor from previous preferences for UltraEdit and TextPad. Now that I’m getting a bit older, I’m not as tied to having the latest gadget and I am quite enjoying challenging myself outside the technology field. This Christmas I was disappointed when I was able to get mobile coverage at our remote hobby farm (home to 13 beef cattle and 220 acres of grass and trees), where I like to go to escape the world. Wherever the client wants me, which being a consultant is normally in the corner, or wherever they can find space. At home it looks like this. It depends on my mood, but industrial/gothic is high on the list, as is a bit of Electronica to help speed things along. Notepad++, Toad, PeopleBooks, Google Search and 20 years of previous projects, documents and notes pretty much covers me for most eventualities. The Oracle Virtual Machine PeopleSoft installs are also pretty cool, but only rarely used when onsite. PeopleSoft Directory, allows you to connect to Active Directory and the PeopleCode behind the Test page can be used to build an Active Directory interface using the Business Interlink. Always the effective date/effective sequence joins to JOB. I really need to sort out a macro for that. 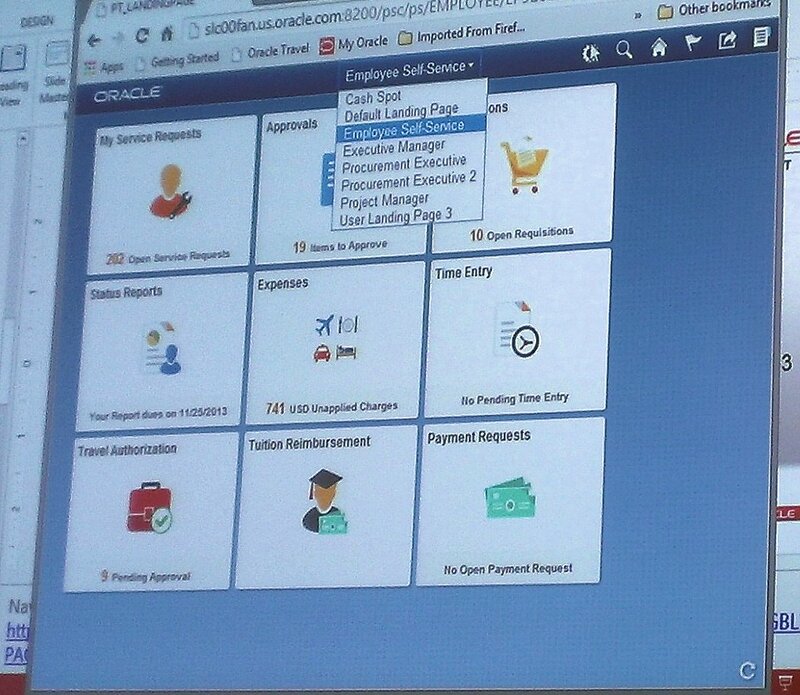 A bit better vision from Oracle, so that customers didn’t have to beg to get PeopleSoft sold to them. 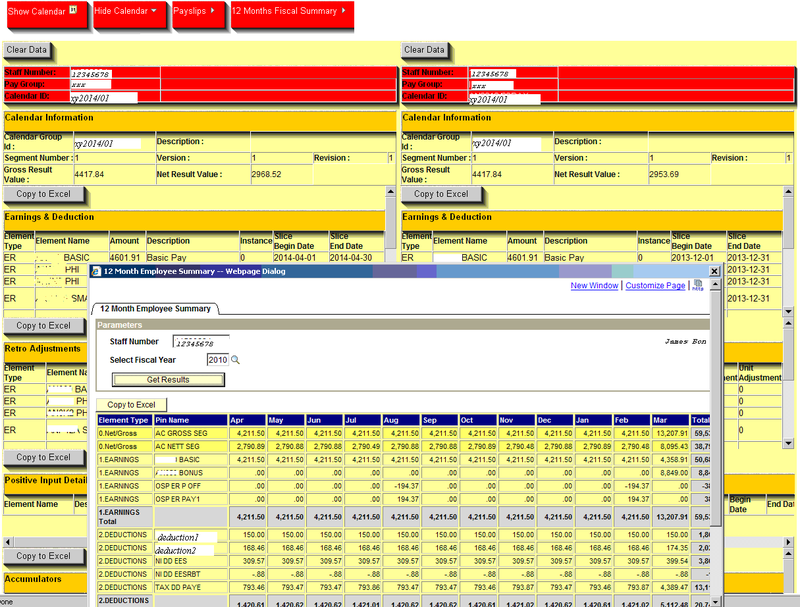 Preconfigured Global Payroll templates for countries. OK, that’s two items, but the first is just a gripe. At one stage I think I had the largest SQR delivered by PeopleSoft… I knew it was the largest, as to add an extra line of code, you had to remove one from somewhere else. I’d probably say I’m reasonably good at working between tech teams, functional teams and the business. I.T. is not about the software, it’s about the people. If projects were about the software, you would press a button and it would be done. 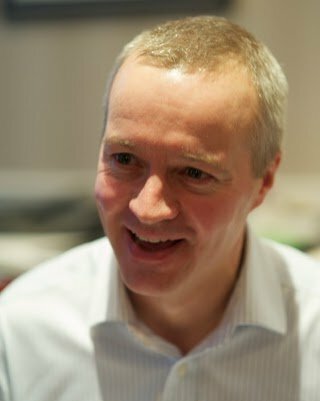 Next up in the ‘How I work‘ series is Simon Wilson, one of my colleagues here at Succeed Consultancy. 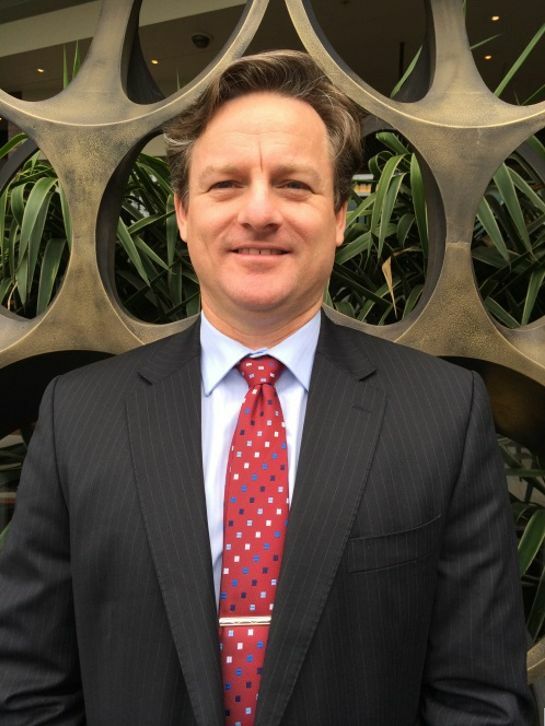 Simon is an experienced hybrid Technical and Functional Consultant across HCM, Financials, CRM and Portal. As well as sterling on-site consultancy, Simon is the Technical Practice Lead here at Succeed so he looks after all of our Techs. Simon can be found on Twitter here and regularly contributes to the Succeed blog (as well as curating all the other entries). 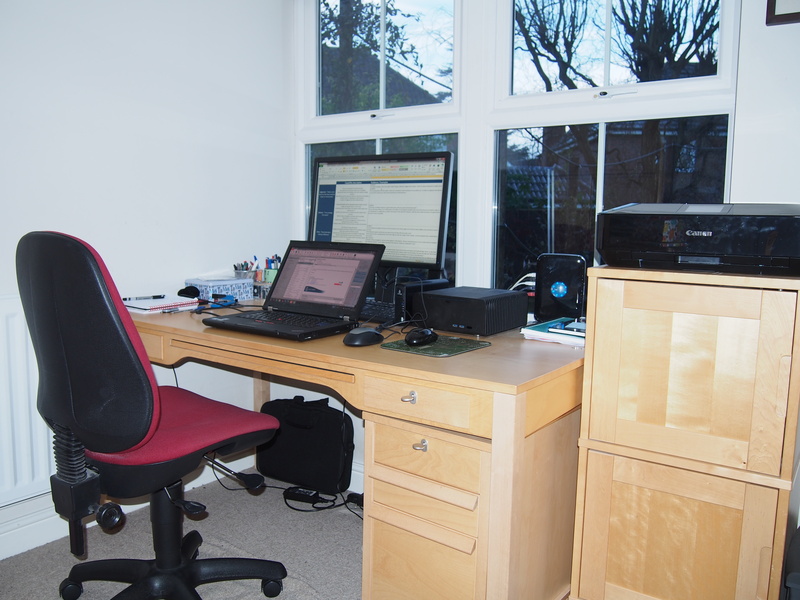 Location: I live in the historic city of St Albans in the UK, a short drive from Succeed’s Office. Current computer: I do most of my work on a standard Lenovo laptop supplied by Succeed. For my home computer I recently got tired of the fan noise from my self-built Shuttle-based machine and replaced it with a passively cooled system from Quiet PC. It’s blissfully silent and quite powerful too. Oh yes, and I also have a Raspberry Pi that I play with occasionally. Current mobile devices: iPhone 5 and 3rd generation iPad. I’m becoming very dependent on Dropbox for files that I need to access across different locations and devices. This is a good example of the use of “the Cloud”, which is something that I probably couldn’t live without nowadays. From accessing my files on Dropbox, to using one of the many PeopleSoft environments that Succeed hosts, to viewing my Google calendar, I’m using the Cloud for many hours of every day. It’s not an understatement to say that using a password manager has changed my working life. I no longer have to remember the usernames, passwords or indeed the URLs that I need in order to access all the different applications and environments I use. I can get the program to generate strong passwords that I don’t ever have to know or even see. All I need to do is remember one strong password and I can ensure I have strong and secure access to everything else I use. Finally, I think PeopleBooks are an excellent resource, and I find myself referring to them repeatedly every working day. Phones and tablets are so powerful nowadays that additional gadgets are increasingly being rendered redundant. However, I’m very fond of my new Sonos music system. When I’m not on a client’s site or at the Succeed office I’m lucky enough to have a study where I can shut myself away from the rest of the family. 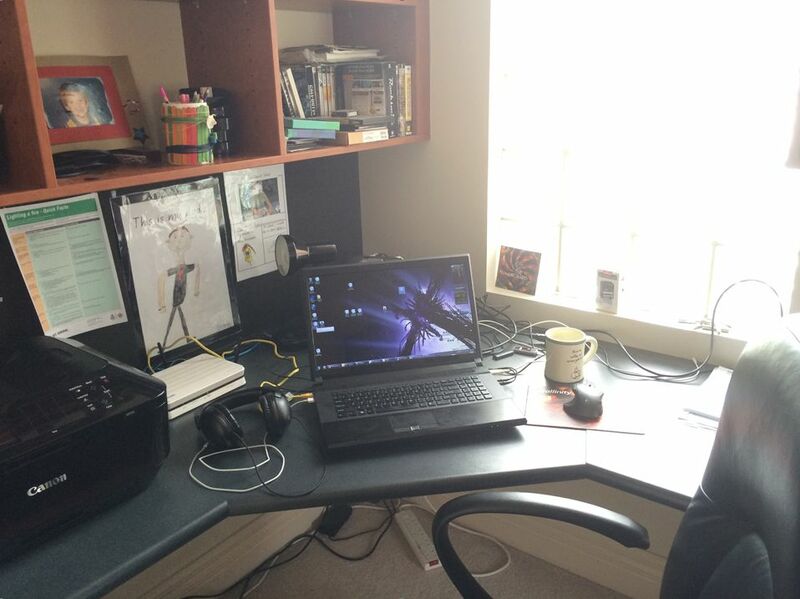 It’s not usually as tidy as shown in the photo. There’s no standing desk, but I tend to find myself on a lot of conference calls, during which I try to stand. I’ve never found it easy to concentrate when there’s music playing, so I tend to work in silence. Sometimes, however, I need to block out a noisy office, in which case I will go for guitar-based instrumental music that I know quite well and will therefore not demand too much of my attention. Examples are the hypnotic rhythms of Ali Farka Toure and Toumani Diabate, Ry Cooder’s large catalogue of film soundtracks or the Django-esque virtuosity of Joscho Stephan. Migrating Pagelet-Wizard pages and Pivot Grids between environments is easy – PeopleSoft provides pages that generate the Export and Import DMS files for you under PeopleTools > Pagelet Wizard > Export/Import Pagelets and Reporting Tools > Pivot Grids > Pivot Grid Admininstration respectively. Admittedly, the pages’ usability could be better, but they do save a lot of time. It has to be effective date sub-selects. The %EffDtCheck meta-sql has saved me a lot of time in this regard. One that springs to mind is the ability to open more than one class in an Application Package at a time, or at least a better way to navigate the Application Class hierarchy. When investigating errors I’ve lost count of the number times I’ve dived into a class’ parent’s parent only to lose my bearings and have to start back at the original call. Before joining Succeed I was an independent consultant and during the early part of my PeopleSoft career I spent several years as the only technical resource at one particular client. With nobody else to bounce ideas off I had to become good at coming up with solutions to problems independently. They may not have been the most efficient or elegant ways of doing things, but they generally worked. When you’re close to a deadline and the whole team is working flat out, I have found this ability to be self-sufficient invaluable. I can still remember being told by my boss during the mid-1990s that I ought to get myself trained on “this new thing called PeopleSoft”. It’s more of an aphorism than a piece of advice, but I think it’s true that you should embrace change because in the IT industry it’s the only thing that’s constant. Finally, we have a saying within Succeed that “SQL is your friend”, meaning that you can save yourself a lot of time and get quality answers to your questions if you know the data model and can write SQL to extract the information you want. Increasingly nowadays this is being morphed to “Google is your friend”, because someone somewhere in the world is likely to have experienced a similar issue to you and have blogged or raised a question about it.